This is the Finnish paperback edition of Coyote Waits, Tony Hillerman's tenth Navajo mystery. It was translated into Finnish by Jyrki Raivio and published in 1991 by Otava in Helsinki. The front cover (design uncredited) displays the author name printed in red above a reproduction of Peter Thorpe's original artwork for this novel, a Navajo Yei figure in gray, black and white, overlaid on a geometric-framed drawing of leaping flames in orange, red, brown and black, beneath a dark blue sky. The overall background of the front cover is pale blue with mottled beige shapes. The publisher's series name, "S E V E N," is printed across the top of the front cover. 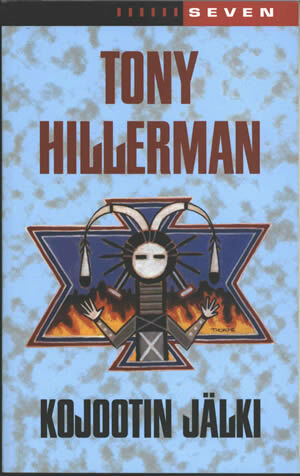 On the back, the publisher's series name is printed across the top, above a synopsis of the novel in black, and a biography of Tony Hillerman in red, on the same mottled background as the front cover. The bar code and other information are printed at the bottom. Binding: Full-color paper covers. The author's name and book title are printed on the spine.